Almirez Teso la Monja 2014, Here are two terrific efforts from the moderately sized appellation of Toro. 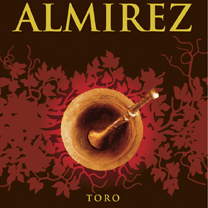 Almirez Teso la Monja 2014, these are big, flavorful, pedal-to-the-metal style of dry red wines, both made from 100% Tinto de Toro. The Romanico is aged six months, Almirez partially fermented in barrel and aged for 14 months prior to bottling. More expensive is their 2014 Almirez, which spends much longer time in oak and comes from vines 15-65 years old in slightly higher elevations. I didn’t see much difference in this wine from its less-expensive sibling, although this one had more grilled meat and almost Provençal, Châteauneuf Du Pape-like blood characteristics, with blackberry and cassis, full body and a long, lusty finish. Some licorice also makes an appearance in this impressively constituted wine. Drink it over the next decade. The Eguren family fell in love with this land more than 15 years ago, seduced by its pre-phylloxera vines, deep roots vineyards meticulously chose to translate the minerality of the soils in powerful and elegant reds. And our love for Toro remains unchanged. Founded in 2007 by the Eguren family, five wines are elaborated in the cellar: Romanico, Almirez, Victorino, Alabaster and Teso La Monja, the most exclusive project that takes the name of the winery. The deep roots of the old vine Tinta de Toro grape translate the pure minerality of the soil into powerful yet elegant red wines.